I used to make soda cake with my friend and now husband while we were in college. We didn't have access to eggs or oil or anything else, but soda cake was perfect because you just needed a can of soda and box of cake mix. I saw this recipe on pinterest and it reminded me of soda cake. Just as easy, just as yummy, but different option. I also love that you can try lots of different fruits, sodas, and cake mixes. The possibilities are endless! 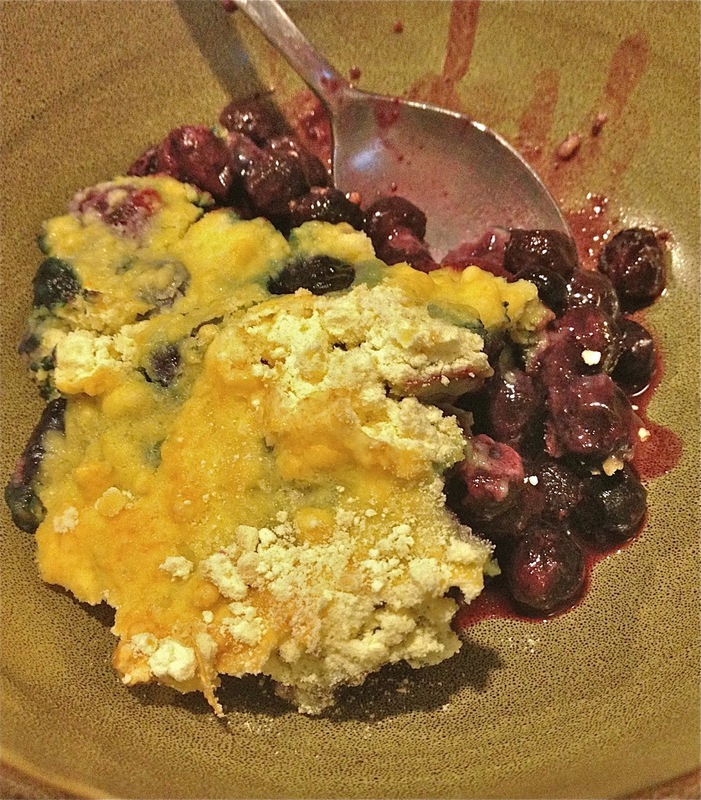 I've tried apple and blueberry cobbler and they were both delicious. 1. All you need are 2 16oz bags of frozen fruit, 1 can of diet soda, and a box of cake mix. Preheat oven to 350F. 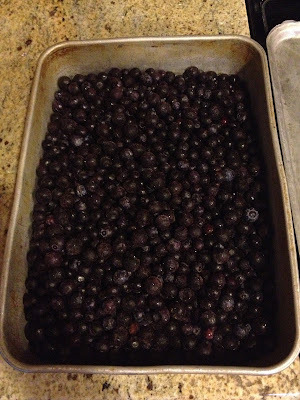 Place your fruit (still frozen) into a 9x13 pan. Make sure it is distributed evenly. 2. 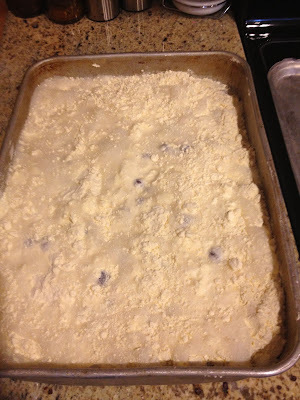 Sprinkle the package of cake mix over top of the fruit (I used yellow cake mix). 3. Pour can of diet soda over top of cake mix (I used diet Sprite). 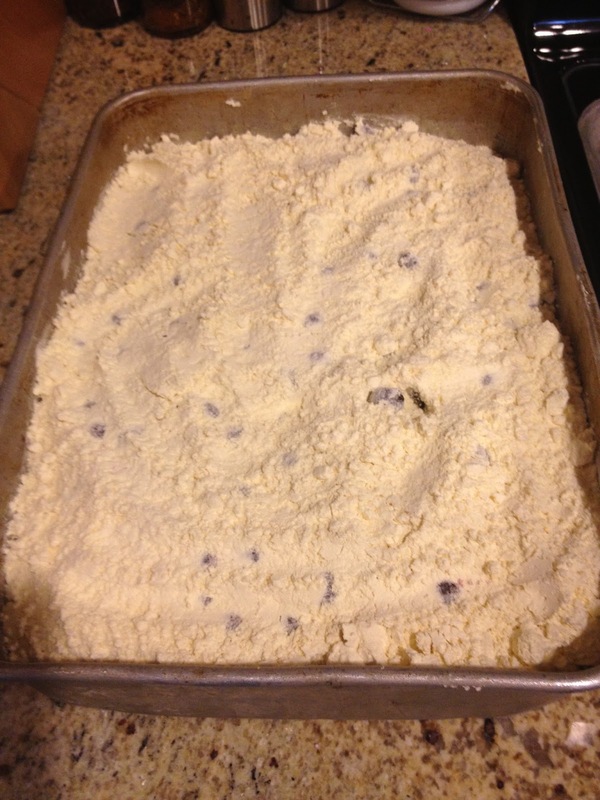 Cover with foil and bake for 20 minutes. Remove foil and bake, uncovered for an additional 40 minutes. We definitely had blue mouths and teeth after having this! I'd tell you to try it with ice cream, but that kind of negates the purpose of a low fat, low calorie dessert I guess. 1. Preheat oven to 350F. Spread fruit evenly in a 9x13 pan. Sprinkle cake mix over top and pour soda over cake mix. 2. Cover with foil and bake for 20 minutes. Remove foil and bake, uncovered for an additional 40 minutes. Oh my gosh, that looks delicious. I've never heard of soda cake (do I live under a rock?!) but am so intrigued! 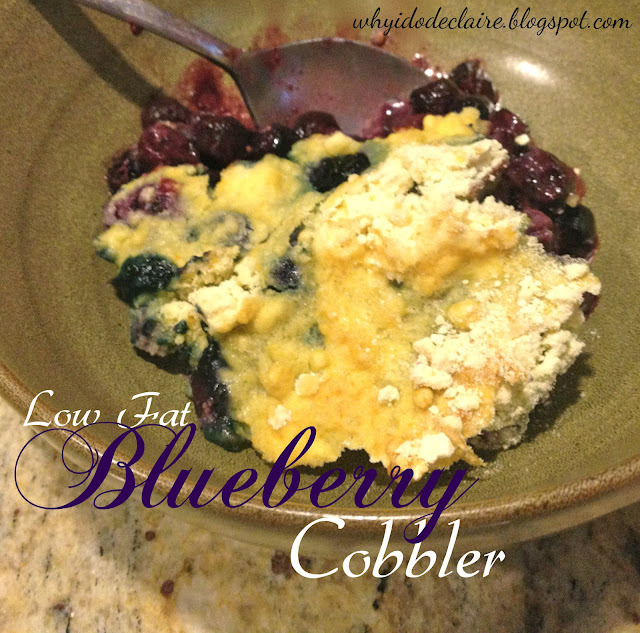 I definitely want to try this out - I LOVE blueberries!! That sounds delicious! And it would be fun to play around with flavors! Blueberries are so yummy. Really? We love soda cake and don't make it the other way any more. If you use fat free whipped cream instead of frosting it's not that bad for you at all! I hope you like the cake or the cobbler, whatever you end up trying! I know! The original website even suggested cherries with chocolate cake and cherry coke soda or apples with spice cake and ginger ale. It all sounds delicious!